Over time, Enterprise technology has evolved from a mainframe environment (Platform 1) to a client-server environment (Platform 2) through to a third platform. Platform 3 is built on a virtualized environment that offers a number of processing options, both within and outside of the enterprise. Virtualized compute loads—combining processing, storage and input-output functionality into a single virtual machine (VM)—allow the distribution of computing demand across various servers seamlessly, without disrupting processes. VMs can also shift computing processes from within the enterprise data centre to a cloud computing environment, whether a public (shared tenancy) cloud model or a private (non-shared tenancy) model. This allows enterprises to scale resources in response to changes in computing demand—for example, seasonal peaks in retail traffic. A virtualized model of computing can increase the utilization of computing resources. Most data centre servers run at less than 15 per cent capacity, though they sometimes peak at a compute demand beyond their capabilities. Virtualization can increase utilization to 85 per cent and shift workloads to other resources when peak demand exceeds the power of a dedicated server. This management of computing resources reduces the cost of hardware, as well as operating expenses, like power and cooling. Many formerly discrete business workloads are now being brought into the virtual world. For example, enterprise voice over IP (VoIP) solutions are treated as a computing workload that can be brought online in the data centre and virtualized, with the same advantages that apply to the data network. 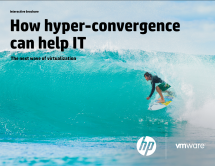 The HP Converged Infrastructure Business Value Calculator is a tool that helps evaluate the cost savings of moving from discrete data centre components to a converged, virtualized environment that combines compute, memory, I/O and network capabilities into a single package. 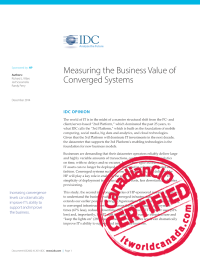 It provides an analysis that showcases the business value of a simplified, small-footprint, scalable data centre environment. The tool is available in 10 languages, accommodating North American, European and EMEA customers.